The 2017 Christmas season has come and gone, but it doesn’t mean we can’t enjoy a new Christmas Horror movie, right? In 2016 we had the chance to review Troy Escamilla’s first feature, Party Night and since the announcement, we have been waiting to see Stirring. This summer I had the chance to meet Troy and talk a little about his newest film, Stirring. He offered a couple of spoilers as I tried to press him for as much on the project as I could. I could tell by his excitement Stirring, like Party Night is going to be a kind of “passion project”. Especially knowing one of his favorite horror films of all time is Black Christmas, so knowing that, he was going to dig in and make a Christmas horror film. First thing I want to mention, the “cold opening” is terrific and really sets the tone for the film. The movie begins at a sorority house with an initiation prank and some straight up bullying by the Queen B off Delta Sigma Sigma. This prank proves to be deadly. The film picks up 10 years later on the former Queen B’s younger sister is now apart of the sorority. It is just before Christmas and the girls of Delta Sigma Sigma are getting ready for their Christmas party. But something sinister lurks around the sorority house. So, now the question is, what did I think of this movie. As I said, I really enjoyed the beginning of the film. The subtle and ominous Christmas score was fantastic and along with the set decorations really did set the tone and feeling for the movie. The gore effects are great, there is a scene Troy told me about and it is really well executed, it involves a candy cane, that is all I will say. But the gore and the blood are dialed up from Party Night. With that said, Party Night was a fun Indie horror movie, but Stirring is a huge step for Troy Escamilla. The story telling and multiple twists keep you on your toes while watching the movie. The characters in the film have a good amount of depth and I have to say the familiar faces from Party Night are a welcome addition to this film. But one of the most enjoyable things are the effects by Heather Benson. Her effects were realistic and not to crazy, but not subtle either. There are some terrific kills and plenty of blood for the gore hounds. 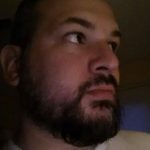 Stirring doesn’t currently have a score on IMDB.com, but it will soon. Troy literally finished cutting this together a few days ago. 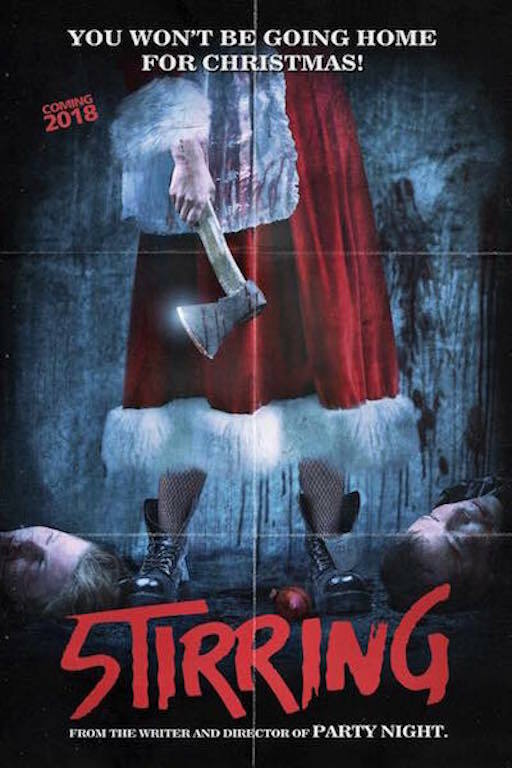 I give Stiring a solid 7.0, it is a good horror film and it is bonus that it takes place on Christmas. We have seen a lot of Chirstmas horror lately and Stirring stands out to me. Billy Brannigan, Ryan Poole and Drew Shotwell were great, Drew had some hilariously choice lines, while Ryan Poole has stepped up his acting game. Bill Brannigan plays the role of the supportive boyfriend perfectly, I really like these guys. Helene Udy has a small role, but super effective and another 80s slasher actress, Brinke Stevens is casted well. But the true standouts are the three guys I mentioned before and like Lauren Topel from Party Night, Kaylee Willaims stands out over all. Over the course of 2018, you will probably get the chance to see Stirring at different horror conventions and film festivals. It is worth a viewing for sure. Not to say anything negative about Party Night, but I really like Stirring more. Thanks Troy and Congrats on the movie.